It's funny how something can go unnoticed for years and then suddenly you see it everywhere. That is how it was for me with Peppermint Bark; that beautiful confection of dark and white chocolate covered with crushed candy canes. The only problem I have with commercially made Peppermint Bark is that it is very expensive. Luckily we can make it at home as it is much easier to make than it looks. Only three ingredients are required, dark chocolate, white chocolate, and candy canes. The difference between commercially made Peppermint Bark and homemade is how the chocolate is handled. 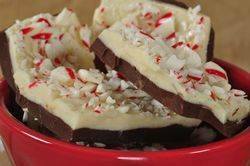 Commercially made Peppermint Bark uses tempered chocolate which keeps the chocolate shiny and hard, even when stored at room temperature. Since most of us are a little hesitant about tempering, this homemade Peppermint Bark recipe omits that step. Instead, a little vegetable oil is added to the melted chocolate which will keep it nice and shiny, and it will still have that wonderful 'snap' when you break it into pieces. It does, however, need to be stored in the refrigerator. If you have spent any time on the site you know I often talk about how the brand of chocolate you use will affect the flavor of what you are making. So, as always, choose your chocolate carefully. There are many good brands of dark and white chocolate on the market, both foreign and domestic. Just be sure to taste the chocolate first as not all chocolates are the same. Some popular brands of dark chocolate are: Ghirardelli, Guittard, Lindt, Perugina, Scharffen Berger, Callebaut, and Valrhona. When choosing white chocolate, always check the label to make sure the chocolate contains cocoa butter. White chocolate needs cocoa butter to give it that sweet yet mellow flavor and smooth and creamy texture. Inferior brands use vegetable fat in place of the cocoa butter and their flavor ends up being very sweet and artificial tasting. Some brands of white chocolate are Lindt, Ghirardelli, Callebaut and even Baker's (found in grocery stores). Peppermint Bark: Line the bottom and sides of an 8 inch (20 cm) square baking pan with aluminum foil, smoothing out any wrinkles. Melt the semi sweet chocolate with 1 teaspoon of vegetable oil in a heatproof bowl placed over a saucepan of simmering water. Immediately pour the melted chocolate into the prepared pan and tilt the pan so the chocolate makes an even layer. Place in the refrigerator for about 30 minutes, or until the chocolate has set. Then, melt the white chocolate with the remaining 1 teaspoon of vegetable oil in a heatproof bowl placed over a saucepan of simmering water. Immediately pour the melted white chocolate over the dark chocolate and tilt the pan so the chocolate is in an even layer. Sprinkle the crushed candy canes evenly over the white chocolate. Place in the refrigerator for about 30 minutes, or until the chocolate has set. Remove the Peppermint Bark from the pan by lifting the edges of the aluminum foil. Peel back the foil and break, or cut, the bark into small irregular pieces. Store in an airtight container in the refrigerator for up to two weeks. Makes about 25 pieces. Preparation time 45 minutes. Pappas, Lou Seibert. The Christmas Candy Book. Chronicle Books. San Francisco: 2002.